These buildings were south of the Isaac Brown building, on lots 8 and 9. The picture was taken in the 1850s, one of the few to survive. The stone building on the left is the home, which may have housed the drugstore of John Heyl Raser, who later became a successful artist. In the center is the Comly storehouse. To the right is the Derickson building. 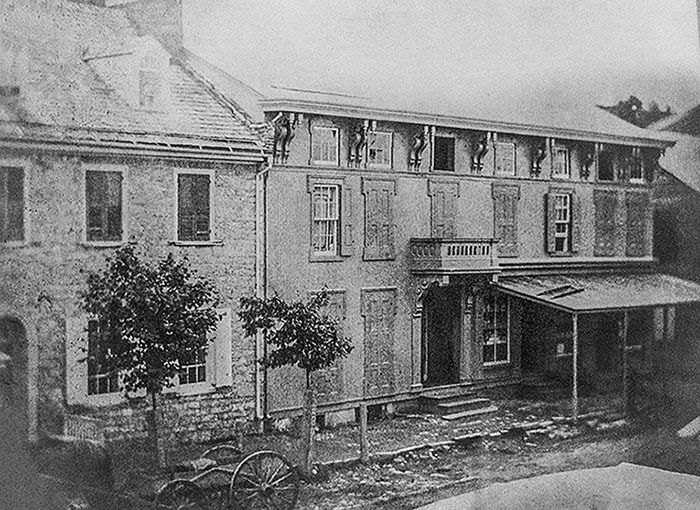 David Derickson died in 1828, and in the 1830s the building became the "Milton House" with Michael Kremer as proprietor. All were lost in the great Milton fire of 1880. Charles Comly died in 1840, but his wife Sarah (Wright) Comly continued his businesses. She owned the property behind these buildings all the way to the canal. In the 1840s, a New Yorker named John B. Reed opened a dry-goods store in this building. In the 1870s, Caleb B. Moore had a clothing store there. History of Northumberland Co., PA 1876: Charles and Thomas Comly conducted business many years in their store on the east side of Front street above the bridge on the lot immediately below that occupied by the Methodist church. They had bought the business from James Moodie, who was a dealer in grain and stock. Go here to see the lots on the Map of Milton in 1790. Go here to see this area on the Map of Milton in 1858. Go here to see the Isaac Brown building.